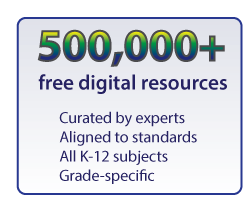 Transform the student learning experience with a very precise solution: Expertly curated resources that are easily filtered to personalize learning for each student. The Matrix is created using patented education-based technology. Resources from established sources are aligned to Common Core and state standards by the subject matter experts at EdGate Correlations Services, the leading standards alignment service for K-12 publishers.As a team of former educators, they select quality resources that they would want to use in their classrooms. Curriculum Matrix® is easily customized with your content. Add access to textbooks and third-party content. Upload district and teacher-created content for sharing within your district. There's even a correlation tool to align teacher-created resources to standards. New efficacy research shows that choice of instructional materials can affect achievement profoundly. In a few clicks, apply multiple filters to quickly bring up the most relevant resources for individual needs. Matrix resources are grade-specific and may be tagged on metadata elements such as content type, format and level of difficulty (challenging, on target or skill builder), as well as by subject and more. From any resource result, click on a Concept Map to view related concepts. Then click on a concept to explore more resources. 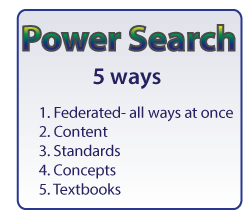 Or do a Concept search for a term, such as "the five senses," to find resources on related concepts. The Matrix may be purchased as a stand-alone product or as a custom integration, with the capability for single sign-on and white labeling by a school or district. EdGate Correlations Services is a division of EDmin. Founded in 1997, the division delivers comprehensive services and products to more than 200 educational publishers. Content is aligned using the EdGate Standards Repository, the largest, most comprehensive and up-to-date standards repository in the world. Originally developed by the EdGate team as a filtered educational search engine, Curriculum Matrix has evolved into a powerful and precise curriculum management tool. Every bit of content in the Curriculum Matrix is ready to use with state standards, Common Core, currently adopted textbooks or any set of objectives used by a district. If you are a publisher or education technology company looking to expand your offering with the delivery of aligned and curated content, please contact EdGate. Curriculum Matrix covers all subjects in grades K-12: for example, 95% of the Common Core (ELA and Math) and Next Generation Science standards, with the majority of these standards having 25 or more aligned resources. The charts below show the resource counts and alignments to national and state standard sets.